NCEES is committed to inspiring the next generation of professional engineers and surveyors. The organization’s 2014–15 outreach initiatives focused on educating the public—including children, teachers and parents, engineering and surveying college students, and educators—on the contributions of engineers and surveyors and the importance of licensure. Through celebrating the professions and sponsoring hands-on learning activities, NCEES promotes careers in engineering and surveying to K–12 students and their parents and teachers. To encourage people to turn their passion for technology and the outdoors into a career as a professional surveyor, NCEES partnered with Geocaching.com to launch #PSnoboundaries, a nationwide trackable geocaching contest, during the 2015 National Surveyors Week celebration. Geocaching is a real-world, outdoor treasure hunt in which participants use GPS-enabled devices to find hidden containers, called geocaches, and log their locations online. #PSnoboundaries featured 2,500 NCEES-branded trackables, which participants hid in geocaches to start them on their journey. As new geocachers find the trackables, they can move them to a new geocache and log the location online. To enter the accompanying photo contest, participants took a picture of themselves with their NCEES Surveyor Trackable at a National Geodetic Survey marker and shared it on Facebook or Twitter using the hashtag #PSnoboundaries. The winners were randomly selected from more than 300 entries. The grand prize winner won a trip for two to the 2015 Geocaching Block Party in Seattle. Another integral part of these outreach efforts was the Council’s continued support of DiscoverE Engineers Week, which is held the third week of February to celebrate how engineers make a difference. The Council participated in a variety of programs to promote the importance of licensure to a larger audience. NCEES sponsored the Best Land Surveying Practices special award for the Future City competition. 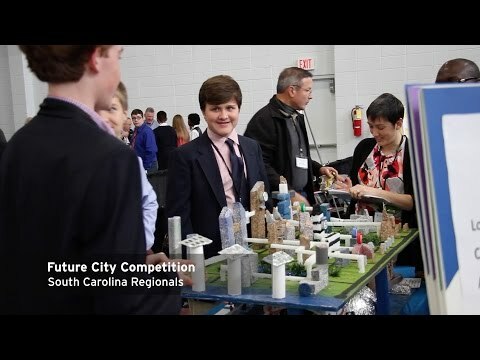 Future City challenges middle-school teams, with guidance from their teachers and engineering mentors, to design a city 150 years in the future. NCEES offered this special award at the regional and national levels, as a result, 2,200 Future City teams—which included 35,000 students—learned how surveying is critical to their communities now and in the future. At the DiscoverE Family event in Washington, D.C., NCEES members, volunteers, and staff shared their enthusiasm for engineering and surveying at two interactive activities designed to introduce children to the professions. This annual event attracted almost 10,000 children, parents, teachers, and community groups. NCEES was the primary sponsor of New Faces of Engineering—College Edition. College Edition recognizes the best and brightest engineering students whose academic successes and experiences have positioned them to make an impact. NCEES also promotes licensure to engineering educators and students through its Engineering Award for Connecting Professional Practice and Education. The award recognizes engineering programs that encourage collaboration between college students and professional engineers. 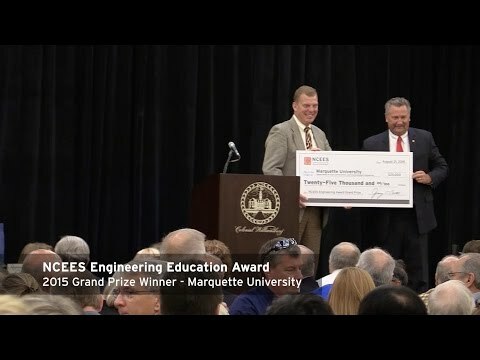 The Marquette University Department of Civil, Construction, and Environmental Engineering won the $25,000 grand prize for its submission Sechum Vehicle Bridge, and five other winners received $7,500 awards. In addition to these learning activities, NCEES provided financial contributions to several organizations to support their outreach efforts. It pledged $500,000 over a four-year period for the American Society of Civil Engineers Dream Big Project. This will include an IMAX movie on remarkable engineering feats, which will premiere in 2016, and a K–12 outreach program to promote engineering in classrooms across the country. Learn what else NCEES is doing to connect professional practice and education.